Written and directed by Nancy Meyers whose work I adore, this is a heartwarming holiday movie to revisit. Or if you’ve been so busy these past few years that you haven’t had a chance to see it yet, it’s definitely one to add to your Netflix queue. Image of Kate Winslet and Jack Black from The Holiday via Google. Filming for The Holiday began and ended in the Los Angeles region. In between, the production set up camp in England to shoot for a month. 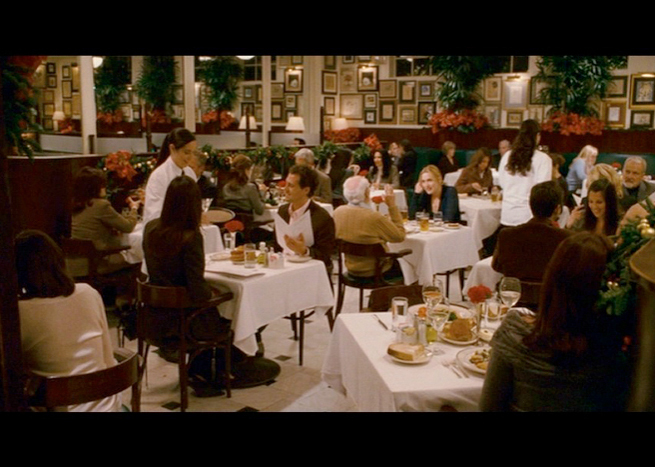 Nancy Meyers purposely wanted to show the two locations as being polar opposite of each other. On the outside, Amanda’s Los Angeles world is contemporary, green and lush. Iris’s hometown is old, snow-covered, and dotted with bare trees. The inside of their worlds are just as different. Iris’s English cottage is small, cozy and warm with lots of colors and mismatched furniture. Amanda’s sprawling California house is modern, sophisticated, and sports a clean, neutral palette. Amanda Woods, portrayed by the very funny and charming Cameron Diaz, owns a Los Angeles company that produces movie trailers. She recently broke up with her unfaithful boyfriend and is looking to escape from her life in L.A. By chance, she comes across an ad for Iris’s cottage onhomeexchange.com. The two women impulsively swap houses for a holiday away from home. 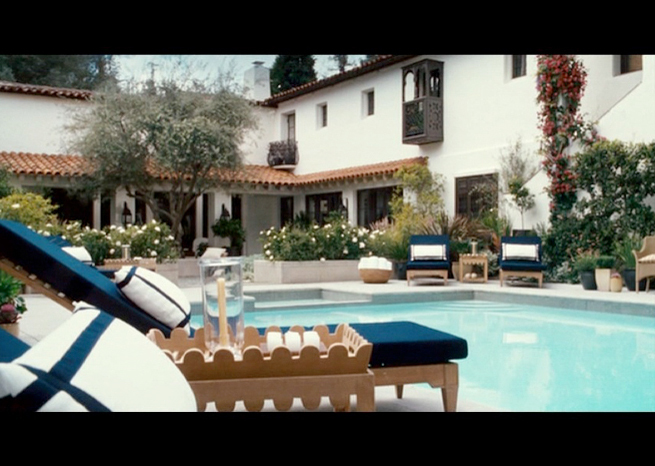 Below is another screenshot from the movie showing the outdoor pool in Amanda’s backyard. The pool turns out to be a pleasant surprise to Iris (along with everything else about Amanda’s stunning California house). PHOTO CREDIT: Above photo of Iris by the pool is from outnow.ch. All the exterior scenes of Amanda’s house in the movie were filmed at a real house in the small, affluent city of San Marino, California. The house, built in 1928 by architect Wallace Neff and located at 1883 Orlando Road, is a stunning, distinctive Mediterranean-influenced California mansion, filled with all the luxurious, modern conveniences. It also belonged at one point to the architect and his family (sometime in the 1930’s). Below is a photo of the house taken more recently. As you can see, the house’s exterior has been updated since its famous role in The Holiday. There’s now a fountain in the courtyard and a new wrought-iron gate (instead of the wooden one seen in the movie). 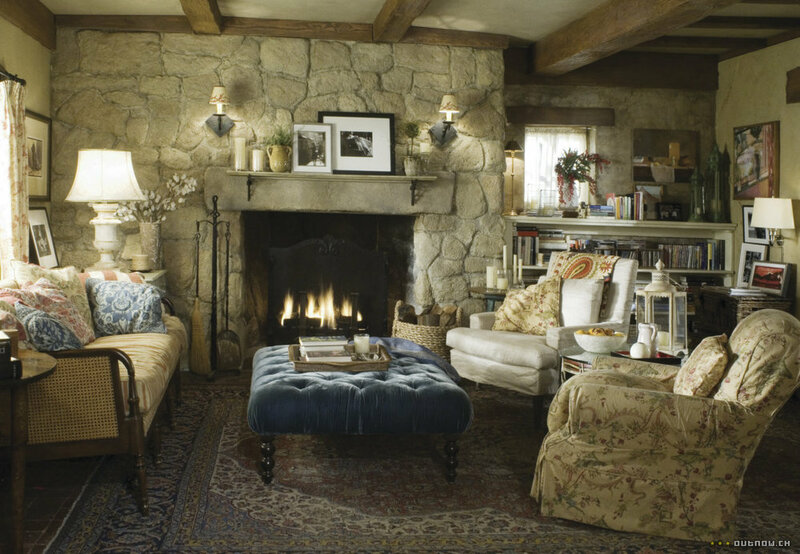 The gorgeous interiors of Amanda’s house were (like Iris’s cottage) filmed at Sony Studios. The production built all the sets for Amanda’s sprawling house which totaled close to 8,000 square feet. PHOTO CREDITS: All of the above photos of the interiors of Amanda’s house are production photos featured on outnow.ch. Now that we’ve had a chance to visit Amanda’s spacious contemporary California house, let’s pop in on Iris’s idylic English country world. To give you a bit of background (but not to give too much away if you haven’t seen the movie), Iris (played by the wonderful and radiant Kate Winslet) is a wedding column writer for The Daily Telegraph, a London newspaper. She’s a smart, beautiful and compassionate young woman who, unfortunately, has been forever in (unrequited) love with her colleague Jasper Bloom (Rufus Sewell). At an office Christmas party, Iris finds out that Jasper is engaged to another colleague. Iris is devastated and comes home with a broken heart. 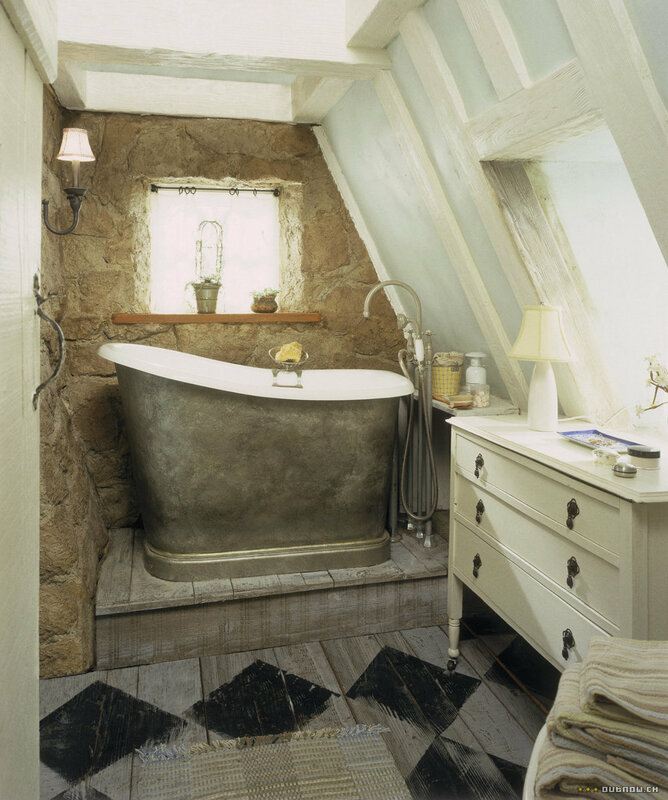 Home for Iris is a lovely English cottage in Shere, a pretty, idylic village with a population of under 4,000 in the Guildford district of Surrey, south-west of London. 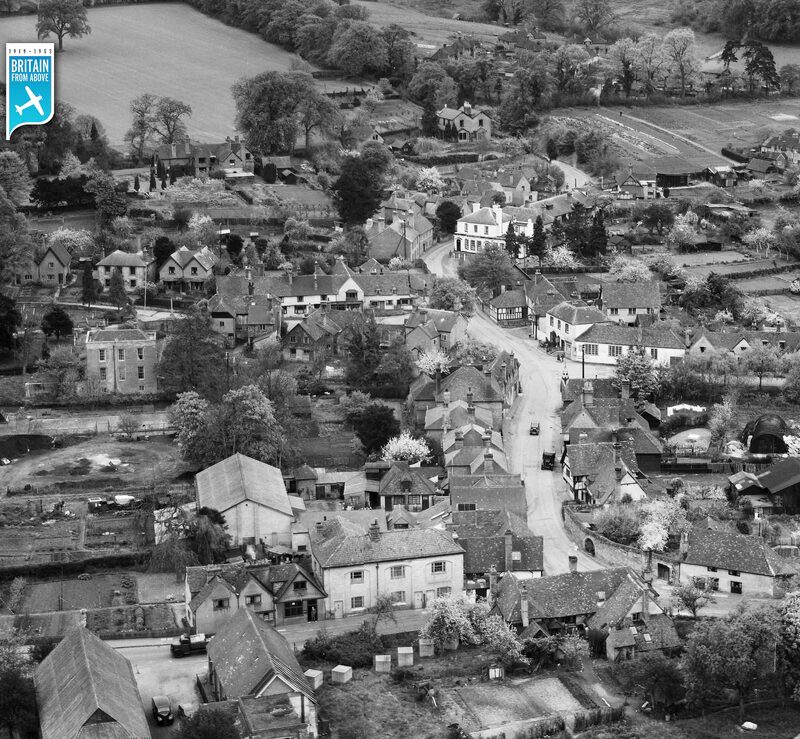 Shere is so charming and scenic, it is easily the most photographed Surrey town of all. Image of Shere, Surrey, England via Google. In addition to quaint village houses, Shere has a collection of small shops, a tea house, a museum, an art gallery, two pubs and an old church. As if that’s not enough to charm the socks off its visitors and residents, there’s also a river stream (Tillingbourne) running through the centre of the village. Here’s a screenshot of Amanda running across the Tillingbourne stream on an old footbridge. In the Director’s Commentary section of The Holiday DVD, Nancy Meyers shared the reason why she decided to use Shere as the film location for The Holiday. Not only is Shere a beautiful, quintessential English country village, it is also just about an hour away from London, where the film cast and crew were based. So filming there made much financial and geographical sense. 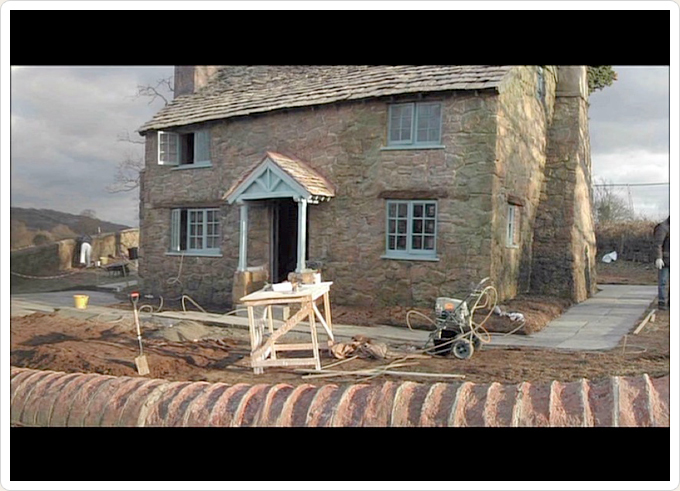 The village’s location and charms have lured many filming productions to shoot there, among those were Four Weddings and a Funeral (1994), Bridget Jones: The Edge of Reasons (2004), and The Wedding Date (2005). Hutman and Greenacre did an extensive search to find the perfect cottage for Iris. Eventually, with Meyers’s help, they found one. It was the cutest, smallest English cottage (listed by the National Trust) that would make a perfect home for Iris. However, its location was too isolated, 4.5 hours away from London where the film crew was based. In the end, Meyers and company found an empty field on a hillside overlooking the town of Shere. 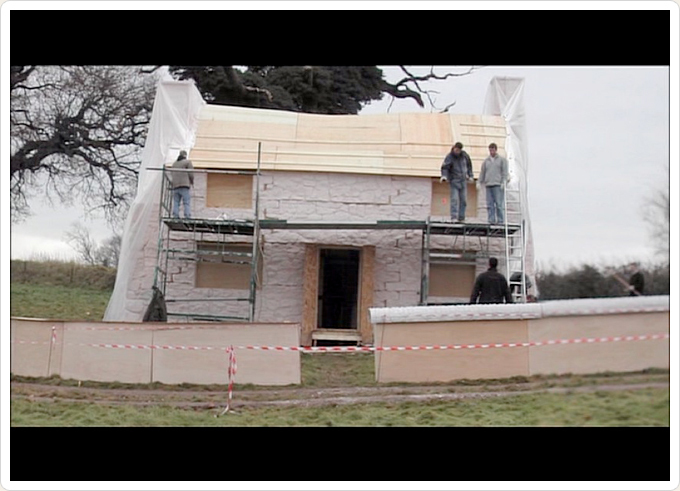 There, they built the shell for Rosehill Cottage where all of the exterior scenes at Iris’s house were filmed. 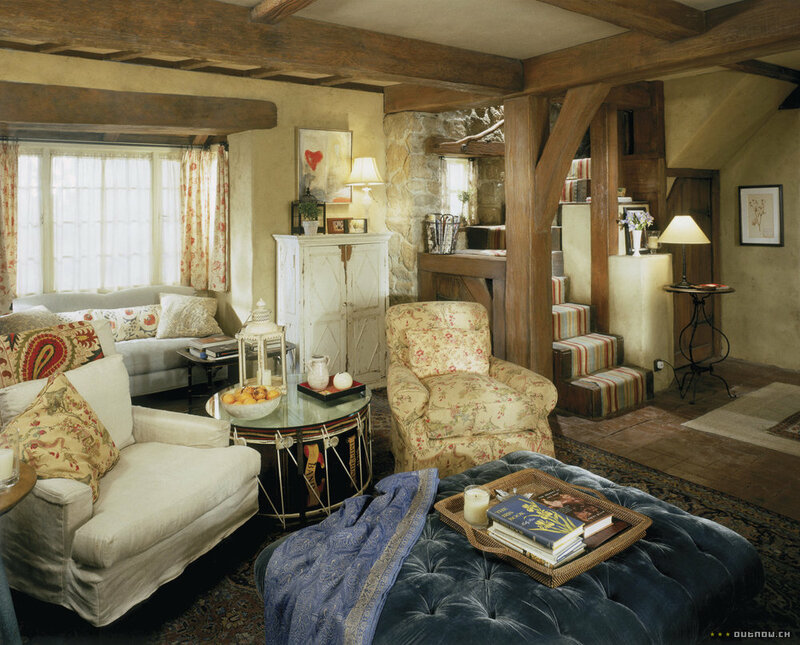 The interiors of Iris’s cottage - like Amanda’s house - were created and filmed at Sony Studios in Culver City. The cottage ... it was quite amazing to watch it being built. It started off as a field and four wooden pegs, and a cross bar held up by two tall men. Within four days, you could actually see the cottage. And then four weeks spent landscaping and gardening the outside to make it look like the garden has been there for, you know, 200 years. As long as the cottage has been there. So the house itself just appeared in one week. 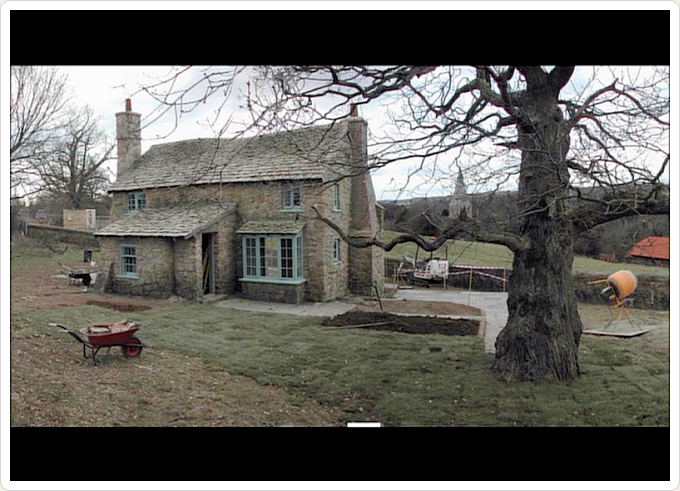 PHOTO CREDIT: Above photo of Rosehill Cottage is from outnow.ch. 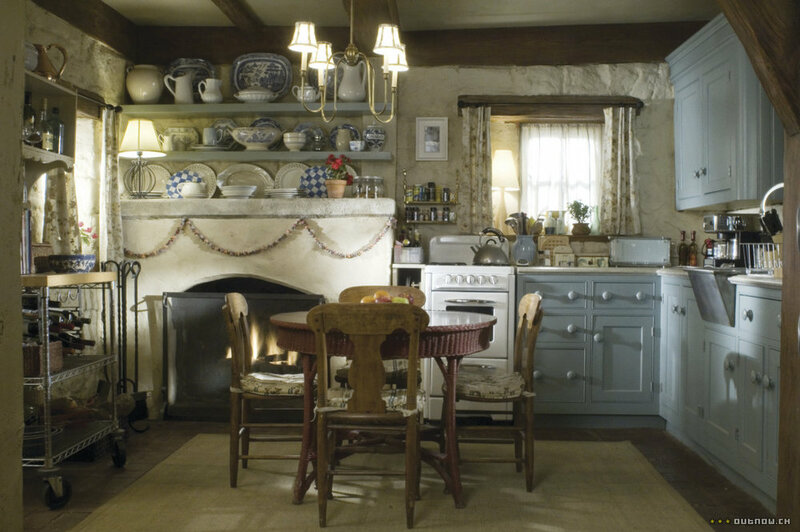 As charming as the exterior of Iris’s cottage is, the interiors are (for me) even lovelier. 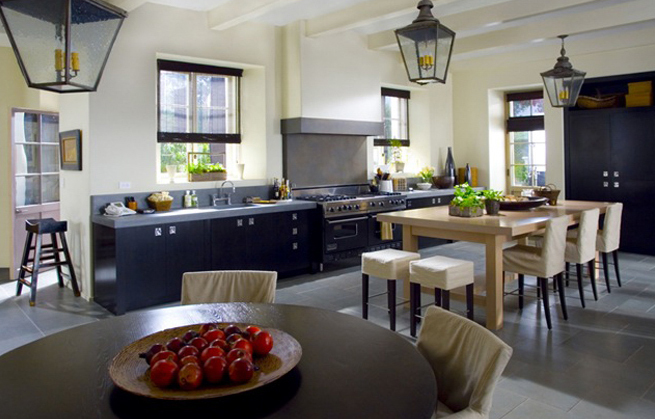 All thanks to the talents of production designer Jon Hutman and, of course, Nancy Meyers. I mentioned a while ago that Amanda’s media room is my most favorite room in her house. At Rosehill Cottage, the little library in the back of the house is my personal fave. 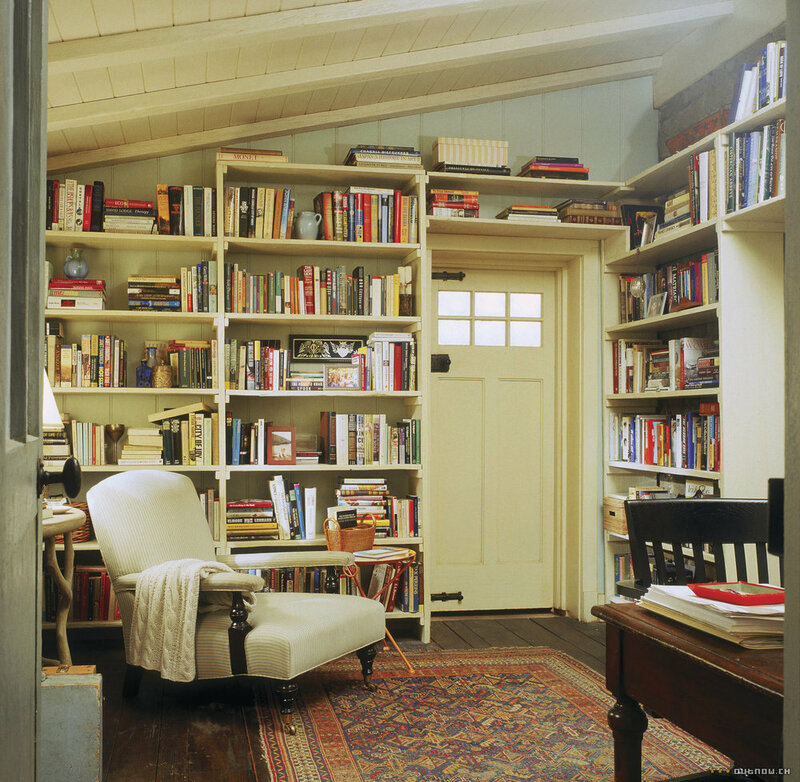 I could spend hours there! If you’ve seen The Holiday, you may recall a scene in which Amanda is shopping in a village market on the day of her arrival into town (see screenshot below). 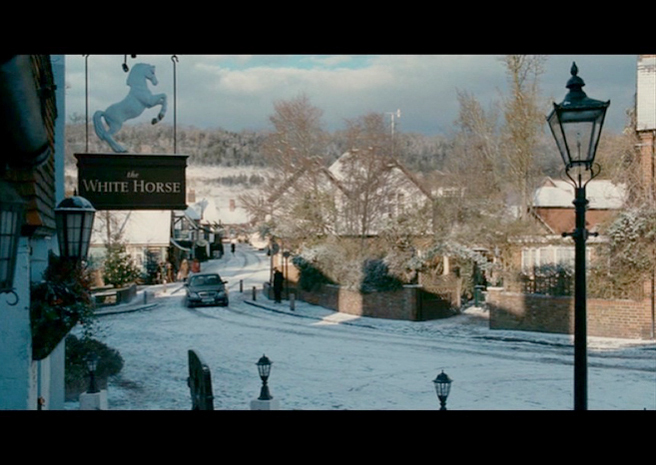 That scene was actually filmed in a candle shop in Godalming, a medieval market town about eight miles from Shere. Why did they use a candle shop to stand in for a village market? Meyers said it’s because all the markets in the area reminded her of a 7-Eleven instead of what she imagined an English village market would be. Godalming was also the world’s first town to have electric street lights. 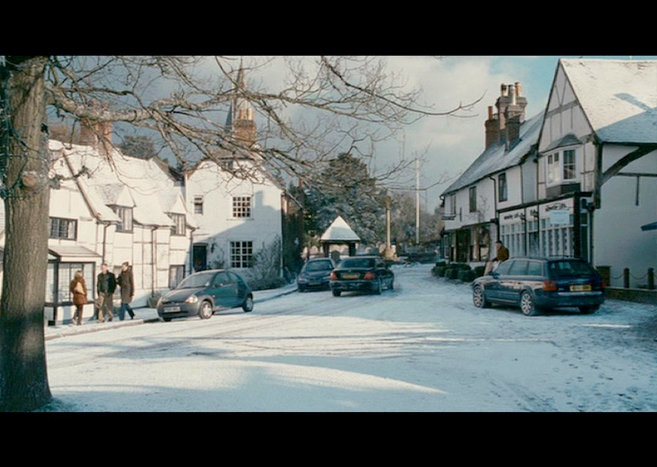 During the filming of the movie, Godalming’s Church Street twinkled with Christmas lights. “Combining the square in Shere with Godalming’s Church Street made for the perfect village,” Hutman says. Godalming is a typical English village, with cobbled-stone streets and attractive storefronts. No wonder the downtown area of the village has often been used as a film location for numerous movies and television programs. It is also on the list of the UK’s most desirable property hotspots and voted the fourth best town in the UK to live in. The love montage of the date scenes (screenshots below) is an hommage to the classic romantic movies from the 1960’s, specifically the 1966 French film A Man and A Woman, shared Meyers in the Director’s Commentary. The beautiful montage was filmed on location at a real Georgian country house, Cornwell Manor in Oxfordshire. Cornwell Manor (90 minutes from London) was built sometime in the 16th century and renovated by architect Clough Williams-Ellis in 1939. Housing eight bedrooms, a dining room, a drawing room, kitchen, library and ballroom, the peaceful country estate (complete with an outdoor pool, sauna, tennis court, formal gardens, and ponds on a 3,000-acre land) and surrounding village all belong to the Hon. Peter Ward and his family. And yes, this beautiful mansion can be yours for a few days with the right amount of Euros. 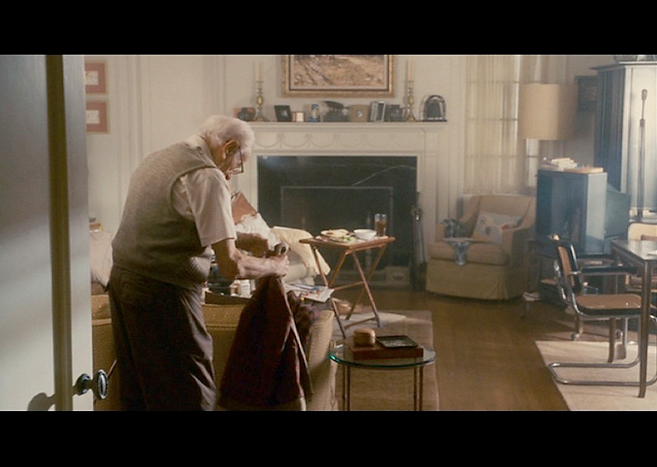 Arthur Abbott (portrayed by the charming Eli Wallach) is a sweet, distinguished 90-year-old gentleman living next door to Amanda. As soon as they meet, Iris and Arthur quickly become fast friends. Iris finds out that her new friend was a screenwriter from the Golden Days of Hollywood. Arthur’s house in real life was the home of Phyllis Diller (an American actress and comedienne) in Brentwood, California. After Ms. Diller’s death last year at the age of 95, her 9,266-square-foot English Country-style house on 1.25 acres was on the market listed at $12.9 million. Built in 1914, it was a summer home for Lawrence C. Phipps until 1965 when Ms. Diller purchased the house and lived in it for 37 years. PHOTO CREDIT: Above photo of Ms. Miller’s house is from here. “It was the house I always dreamed of,” Ms. Diller said, “and here it was, already built.” She loved her Brentwood home and named many of its 22 rooms. For example, the living room was the Bob Hope Salon, her office was the Bach Room, one of the guest rooms - washed in yellow - was named the Canary Suite, the red kitchen was the Scarlet Scullery, the room with an organ was the Pump Room, a powder room was the Edith Head Room, and a mirrored telephone room was the John Wilkes Booth. And below is a photo of Ms. Diller’s office where the above scene was shot. Talk about the magic of Hollywood! Personally, I love Arthur’s version of the office. After all, who can resist spending a few hours browsing through all the books and lovely Hollywood mementos? PHOTO CREDIT: Above photo of Ms. Miller’s office is from here. Miles, Iris’s other new friend, is a Hollywood composer. 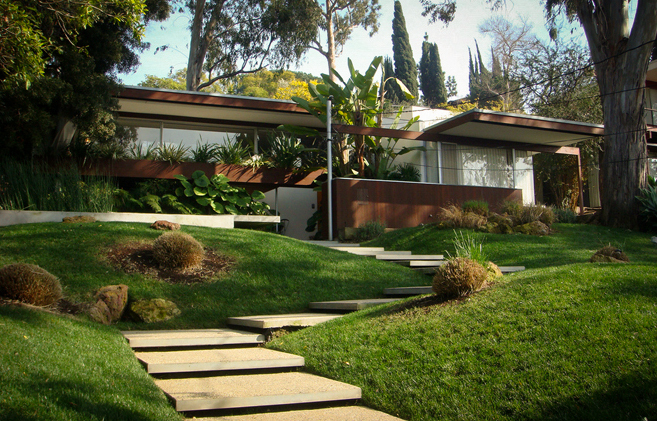 Miles’ house in the movie is a mid-century modernist home situated on a manicured, green lawn somewhere in the Los Angeles area. Miles’s house in real life was the Ohara House designed by the legendary Richard Neutra, an Austrian-American modernist architect. The house is located on 2210 Neutra Place in the Neutra Colony near Silver Lake Boulevard. One of these Pavilion-style homes is the house Neutra built in 1961 for Hitoshi Ohara and his family, appropriately named “The Ohara House.” Now it’s also famous for being the film location for The Holiday. PHOTO CREDIT: Above photo of the Ohara house is from iamnotastalker.com. PHOTO CREDIT: Above photo of the Ohara house is from here. We mentioned Amanda’s and Graham’s romantic date in the English countryside a little while earlier. 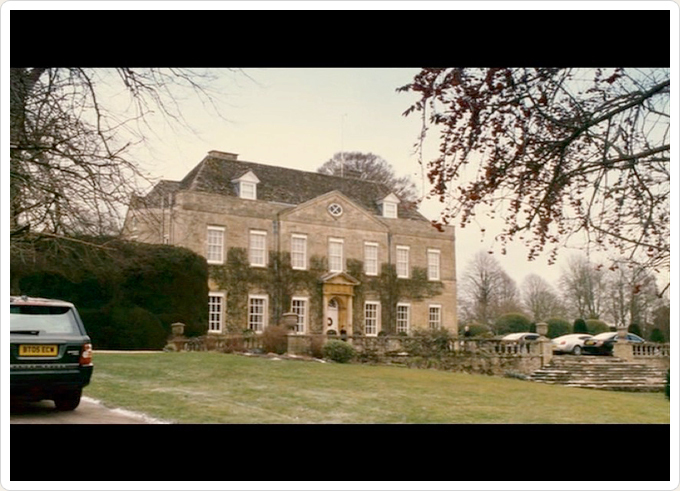 The exterior montage were filmed at the Cornwell Manor. The interior scene however was shot thousands of miles away in Los Angeles’s most famous house, the Greystone Mansion (also called the Doheny Mansion). Greystone Mansion has a famous address, that of Beverly Hills, California. Built in the Tudor-style architecture, the house sits on a landscaped estate amidst well-manicured English gardens. Designed by the architect Gordon Kaufmann, the house was completed in 1928 and was a gift from oil tycoon Edward L. Doheny to his son Edward “Ned” Doheny, Jr. The house was shrouded in mystery when Ned Doheny died in a murder-suicide four months after he and his family moved into Greystone. After his death, his wife continued to live in Greystone even after she remarried. In 1955, she sold the estate to Chicago industrialist Henry Crown who then rented it to movie studios. In 1965, the city of Beverly Hills bought the mansion and made it a city park in 1971. In 1976, Greystone Mansion became one of the National Register of Historic Places. 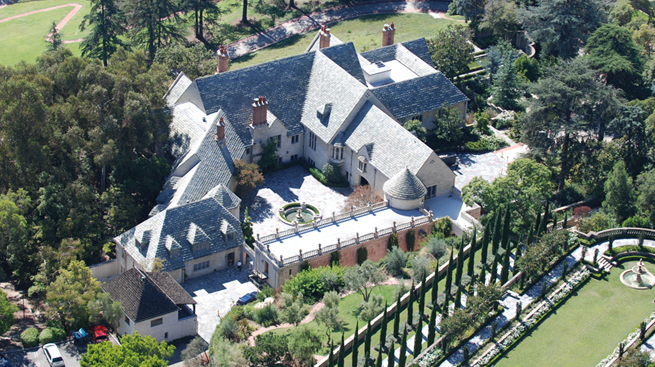 PHOTO CREDIT: Above aerial photo of Greystone Mansion is from here. In addition to being a famous film location, Greystone Mansion has also been home to the play The Manor (written by Kathrine Bates and directed by Beverly Olevin) since 2002. The Manor (a fictionalized retelling of the Doheny family history) is performed in different rooms at the mansion. Greystone is also where “The Annual Hollywood Ball” is held each year with celebrities gathering for a grand fashion show, dinner and auction raising funds for the Pure Foundation. When Arthur and Iris go out for a bite to eat, they dine at a busy L.A. restaurant. The scene was shot at The Grill on the Alley in Beverly Hills. Meyers chose the Grill as the film location for this scene because it is the right place for someone of Arthur’s generation to frequent. In the scene, Meyers had the two friends sitting in the middle of the room to convey that they’re just everyday folks, not Hollywood elites, so they don’t get to sit at any “special” table. The Grill on the Alley in Beverly Hills was opened in 1984 “as a living tribute to the great American grills of yesterday.” It didn’t take long for The Grill to become the home of Hollywood’s “power lunch.” If you happen to dine there, wear your Sunday’s best because you never know who may be sitting at a table next to yours. PHOTO CREDIT: Above photo of The Grill on the Alley is a screenshot taken from the virtual tour posted on The Grill’s website. There is a very funny moment in The Holiday when Miles and Iris are picking out movies at a Blockbuster. To not spoil it for those of you who haven’t seen the film, I won’t say much except that it’s a scene that happened totally by chance which resulted in a surprise appearance of a famous actor in that scene. Have I piqued your interest yet? Nancy Meyers shares in the Director’s Commentary of the DVD that it just so happened that that famous actor was having lunch at a restaurant next door when they were filming the movie. When he saw that a movie was shooting at the Blockbuster, he came over to check it out - out of curiosity. Since he and Nancy Meyers know each other (their daughters are friends), he stayed to watch the shoot for hours. Meyers finally realized she had a gold mine right there by her side and spontaneously asked him to be in the Blockbuster scene. The actor graciously agreed. It was one take and his cameo appearance in the movie was absolutely perfect! On top of that, the one-liner he made up for the scene had the biggest laugh from the audience. It was all quite magical! The Blockbuster used in The Holiday is located in Brentwood, California. However, I don’t have an exact address and am not even sure it’s still in operation today. 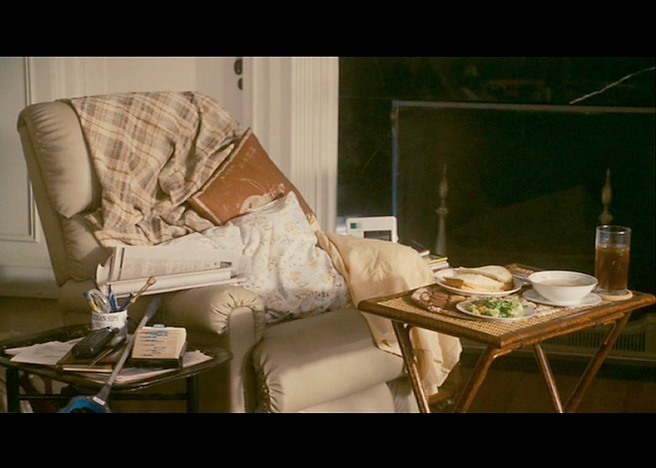 PHOTO CREDIT: Above photo of Nancy Meyers hard at work on The Holiday is from outnow.ch. For more information on filming in California, contact the California Film Commission (a Reel-Scout client). For more information on filming in Oxfordshire, England, contact the Oxfordshire Film Office.